Jackson County Interfaith Volunteer Caregivers, is a faith based organization providing services to older adults, disabled individuals and people with special needs. We will take into consideration all needs. However, to ensure the safety of the volunteers and care receivers, it is our policy to do a background screening on both the care receivers and volunteers. Your initial service may require up to 48 hour’s notice. If you have a need, call Lori or Carol at Interfaith Volunteers, at 715-284-7058, and we will do our best to find a volunteer to assist you. All services are available based on volunteer’s availability and unfortunately not all matches are possible. We are proud to be a part of the Wisconsin Interfaith in Action Network. Our group respite program provides engaging activities for individuals suffering from dementia or memory issues, while offering some much needed relief to caregivers. Families must complete an intake screening, and once accepted can participate for a recommended donation of $10 a day. This program is offered at Family Worship Assembly and a light lunch is provided by Black River Memorial Hospital. Volunteers can provide much needed respite care for caregivers. This is a completely non-medical service but offers some much needed relief to caregivers. Volunteers provide a friendly visitor to loved one safes while giving caregivers some much needed time of their own. Interfaith collaborates with Hansen’s IGA to provide delivery of groceries on Wednesday mornings. If you would like to receive Groceries To Go, call Interfaith at 715-284-7058 for more information about this service. Participants call Interfaith on Tuesday to confirm they will be placing an order, and then on Wednesday, they call Hansen’s IGA at 715-284-4308 to place their order. 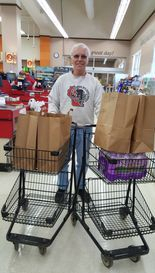 Interfaith coordinates a volunteer to pick up and delivery groceries throughout Jackson County, Wisconsin. Volunteers then take the payment for the groceries back to Hansen’s IGA. We are proud to partner with area businesses that assist us in delivering groceries. Our current business partners are Co-op Credit Union and Regal of Black River Falls. Both businesses volunteer at least once a month, delivering groceries to home bound individuals. If your business would like to volunteer, please call Interfaith. Interfaith Volunteers provide transportation to medical appointments, church, shopping, or to other social gatherings. If you live alone, Interfaith may be able to find a friendly visitor to call or stop, making those days less lonely. Even if you are home bound, you may be able to be a friendly voice for someone else! Occasionally we are able to find a volunteer to do small lawn mowing or snow removal jobs, however depending on conditions it is sometimes hard for our volunteers to get out. We will do the best we can to find a volunteer to assist with small lawn mowing or snow removal, but cannot guarantee the timeliness or frequency of this volunteer service. Our volunteers can help with tasks such as grocery shopping or other errands, depending on need and availability. Volunteers can sometimes assist with lite housekeeping such as vacuuming, mopping, dusting, or other tasks as needed. This is on a weekly, bi-weekly, or monthly basis. For safety reasons, volunteers are not able to help with heavy lifting. Each week Interfaith has a volunteer come in to record a copy of the Banner Journal. Digital copies are then sent out to individuals who are visually impaired. Other digital copies available are Interfaith’s Connection Newsletter, 60 Forward, the Golf Digest and the Guidepost. This is a partnership with the Library for the Blind. Each year Interfaith has volunteers from area congregations and community groups that will help you prepare for fall or spring. 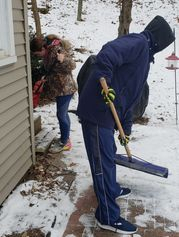 Volunteers are able to help with small projects including raking leaves, washing outdoor windows, cleaning first level gutters, setting out or storing lawn furniture, or other tasks as needed. This is a collaboration with the Black River Falls Library to deliver library books to individuals who are home-bound. High School shoveling a snowy walkway. This is a collaboration with area school districts to provide a mentor to youth in our elementary schools. Volunteers join their students one day a week for lunch or games during school hours. Interfaith is always looking for more volunteers to assist with this program. Students are referred by their teacher or guidance counselor. Interfaith provides essentials to young families such as diapers, wipes, blankets and clothing. Items are donated from area churches, homemaker groups, sewing groups, and community members to provide young families with some basic items to make their transition into parenting a little less stressful.